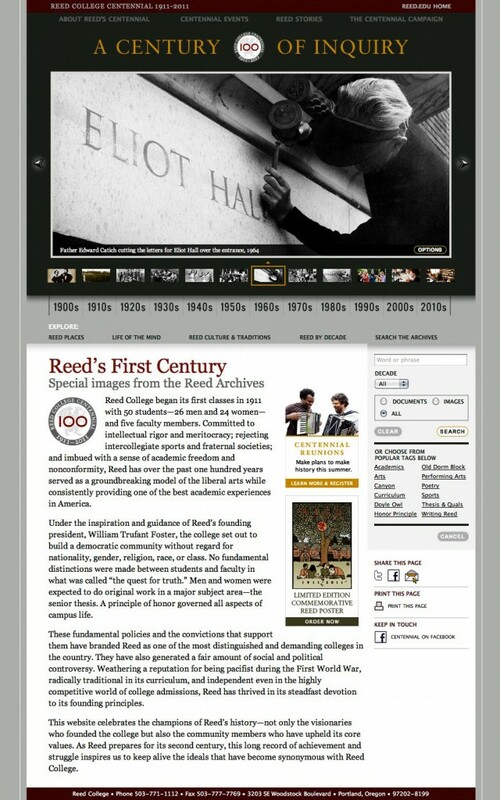 Design, messaging strategy, art direction of archival imagery, and development of this dual-purpose site celebrating Reed’s first 100 years, and launching a $200-million fundraising effort. 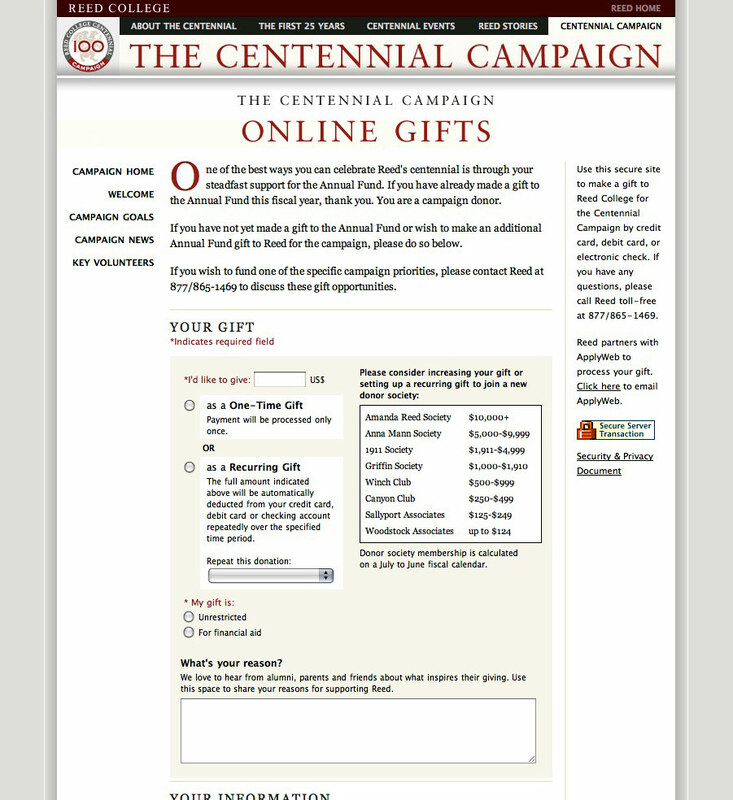 For Reed’s Centennial, we advised on and concocted some of the major messaging, then designed the core Centennial brand, the three sites below, a “case statement” for the Campaign and a host of direct mail pieces, ads, and banners. The fundraising effort was a success. 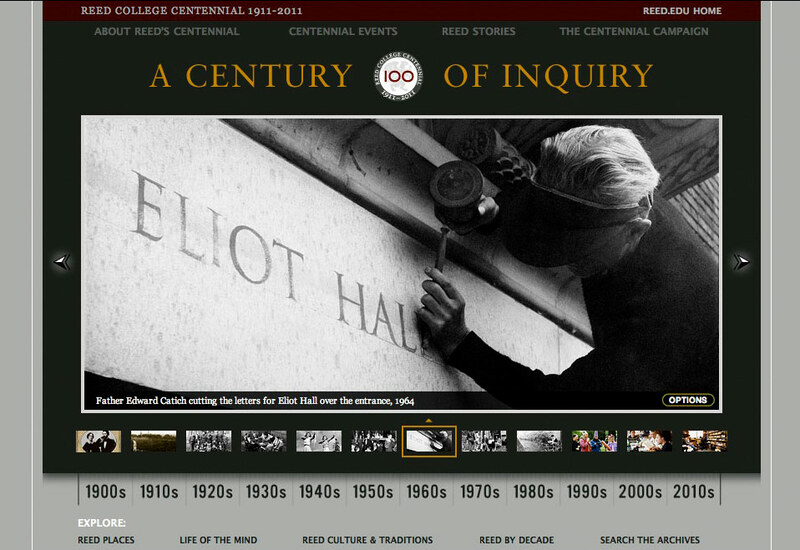 One of the more fascinating – and surreal – parts of the project was creating the marquee images for the Centennial Reunions site. Because the idea of class reunions is about bringing together “then” (memories of college) and “now” (reuniting with old classmates today), I pitched sourcing a few evocative archival images and reshooting them today. There was something incredibly powerful about realizing, as I set up my tripod and framed my shot to match, that another photographer had stood on the very same spot, thinking the very same technical and compositional things, 100 years in the past. 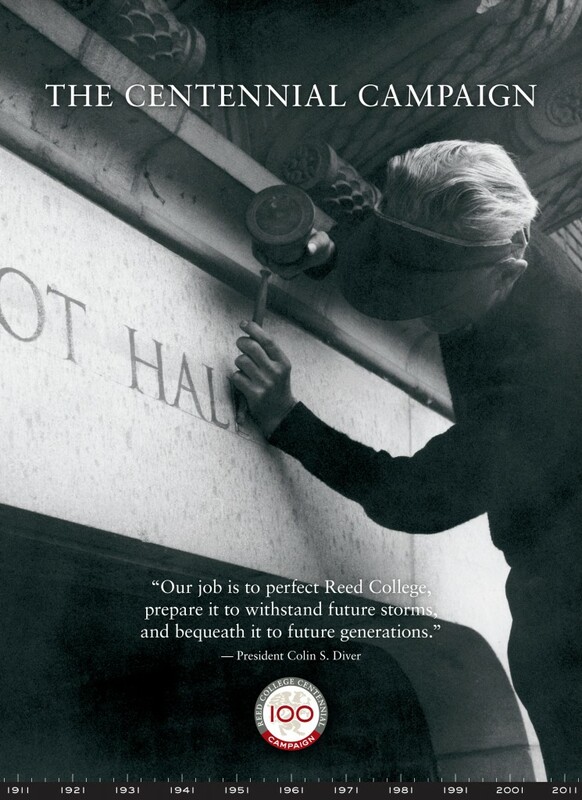 The Reed Centennial brand, which I designed to underline both the college’s history and tradition of academic rigor, and, with a touch of sans serif, its firm foundation today. 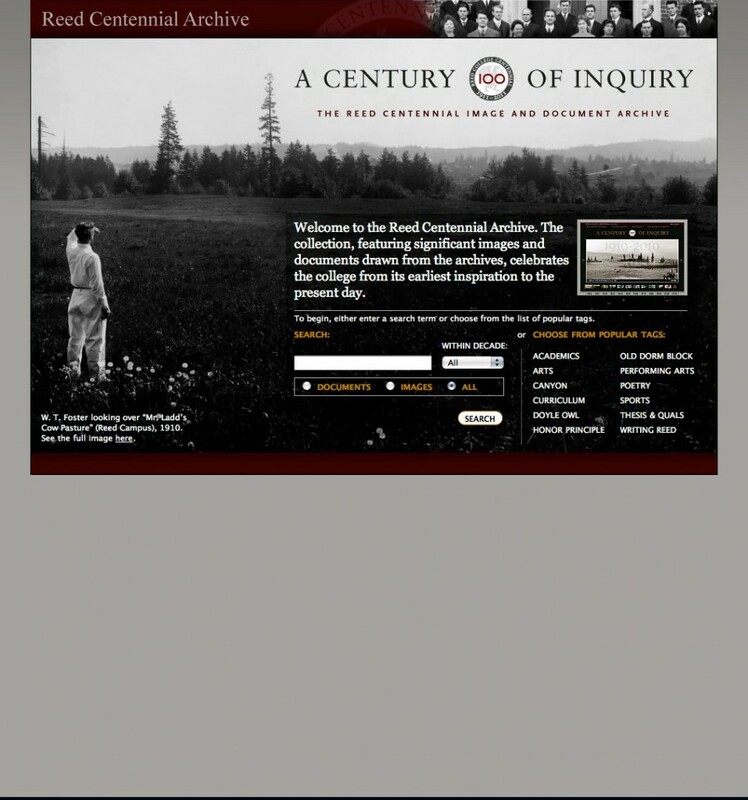 Reed Centennial’s website landing page. 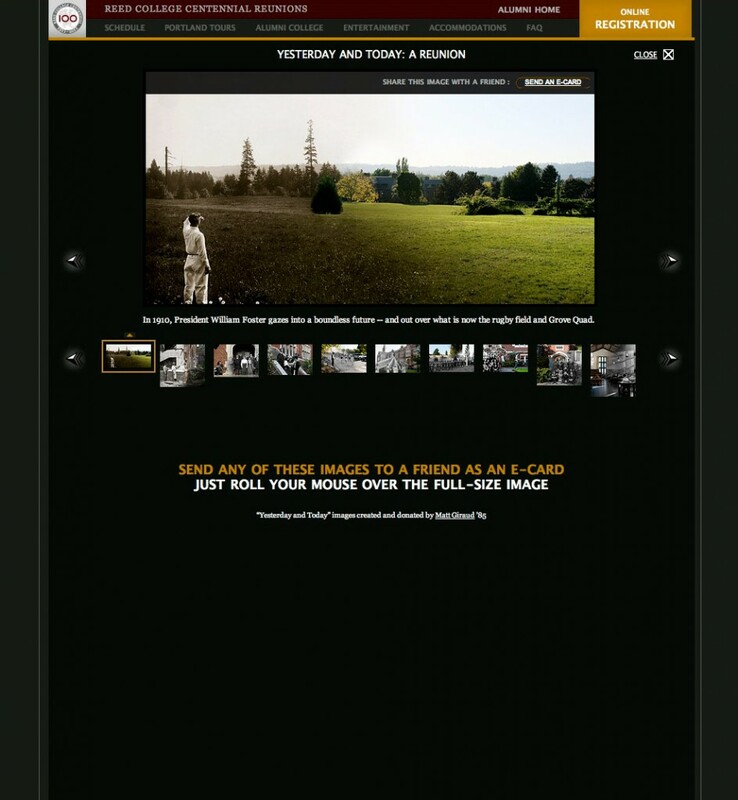 The site itself included a comprehensive archive of imagery we helped curate, cleaned up, and integrated into a central slideshow. This being a college, the site was also designed to integrate with Reed’s archives for further inquiry and study. 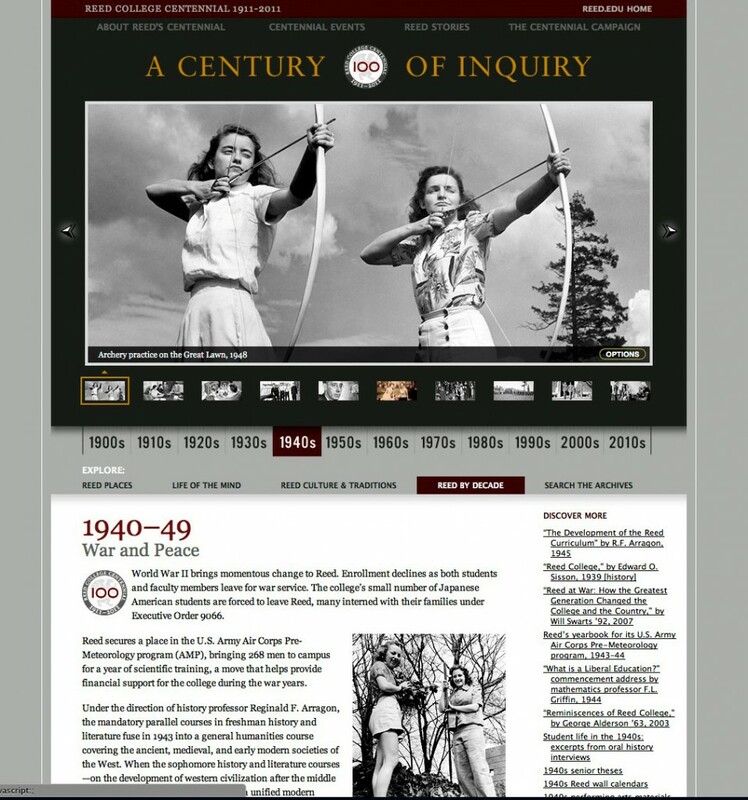 Reed Centennial: a component of the reunions website where viewers can see and share the then/now images we created. 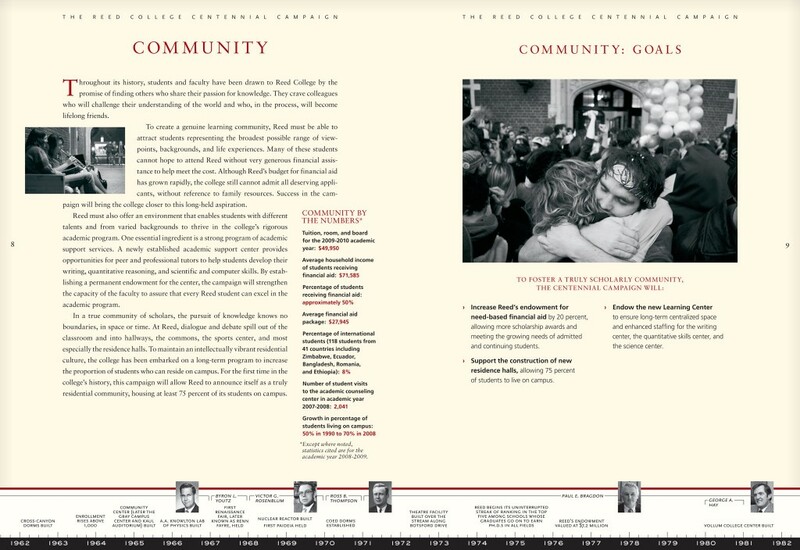 The first spread of the Reed Centennial Campaign case statement. To underscore the richness of what Reed had accomplished in 100 years, we designed a timeline to run the length of the book. 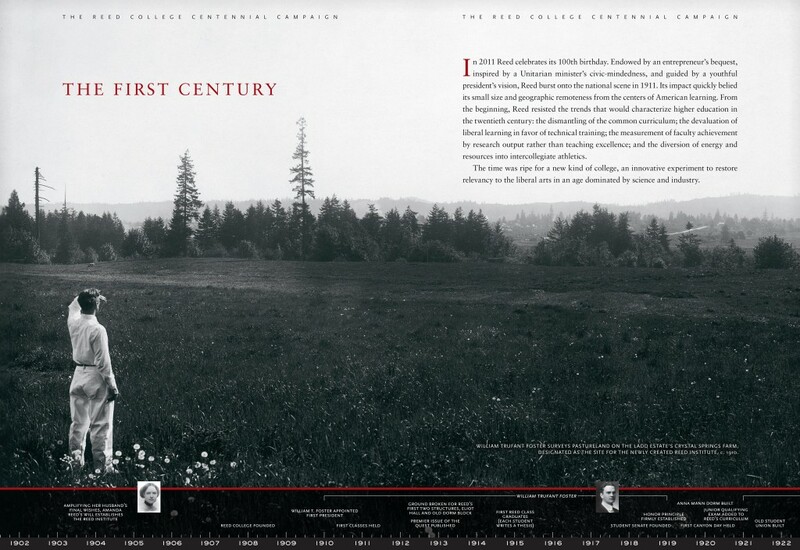 An interior spread from the Reed Centennial Campaign case statement. 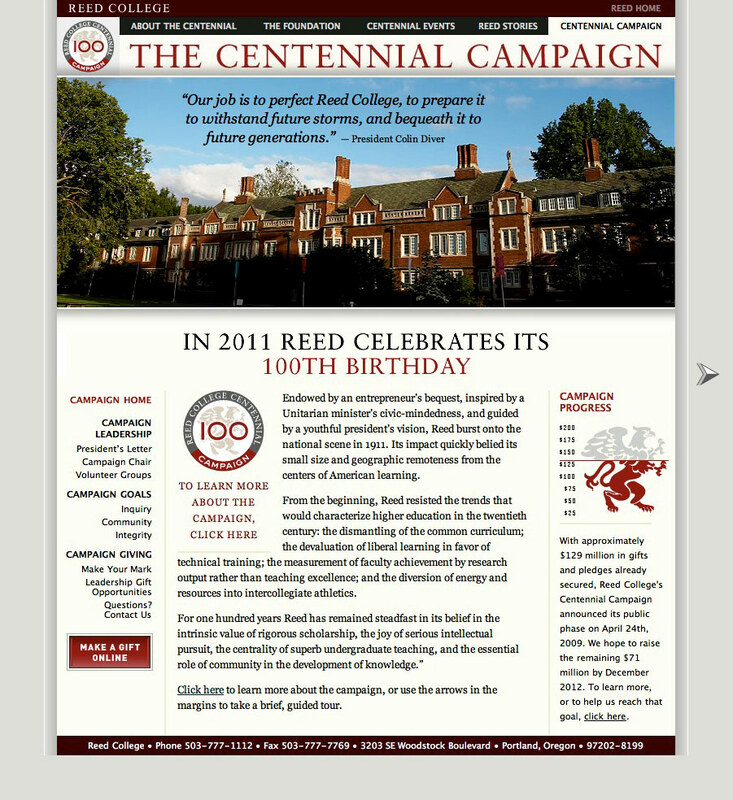 Reed Centennial Campaign website home, which we designed to be light and focused on the future, without losing the college’s mission of academic rigor. In addition to digital repair and cleanup of a host of archival images, we also created the gateway for the collection in Reed’s Archives. 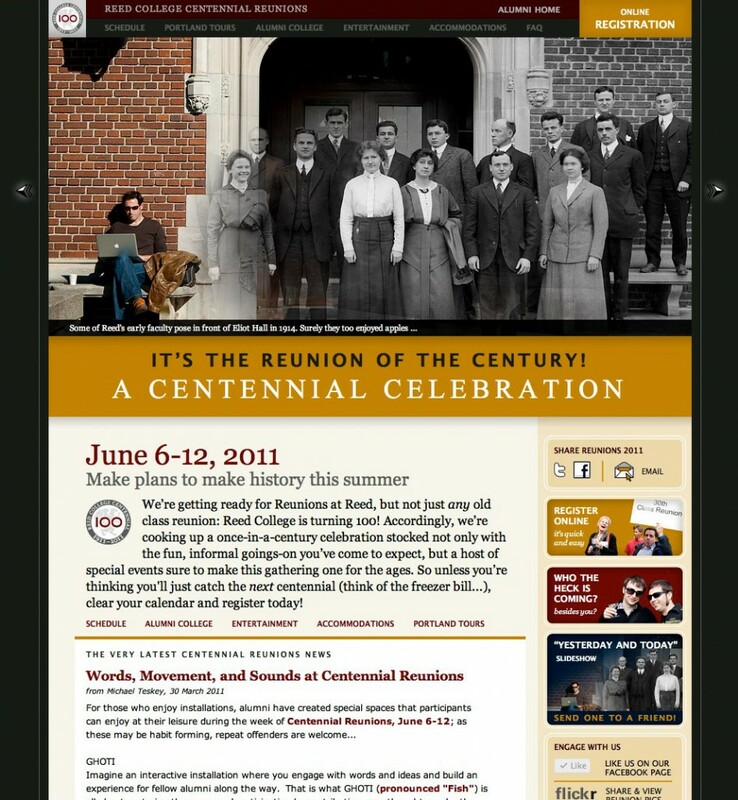 Reed Centennial: a Reunions website we designed to inspire attendance (it proved to be the largest reunions ever). In addition to design, development and key messaging, we also created then/now images juxtaposing historic images with the same shot today.